Everyday beginning at 4:45am and ending long after sunset, Jupiter Jones (Mila Kunis), a maid, lives the same day over and over. Alongside Jupiter’s family, she cleans and cleans and cleans. Jupiter wants more, but she sees no end to her humdrum existence. She hates her life. Her future and her past are coming for her. I know that is not much of a setup, but of the small amount of information presented, that is all that seemed relevant. The story’s relevant background was not explained well, fragments popped up here and there but still left you wanting. Many holes were left sparsely filled. I can appreciate the handsome creation that is Channing Tatum (even with the weird hair). As was evident in Step Up, Magic Mike, even Foxcatcher, Tatum possesses great flexibility and wicked flips and tricks, which were well utilized in Jupiter Ascending. Although Tatum’s athleticism and strength as well as looks, made him ideal for the role of Caine Wise, the character didn’t give him much to work with. 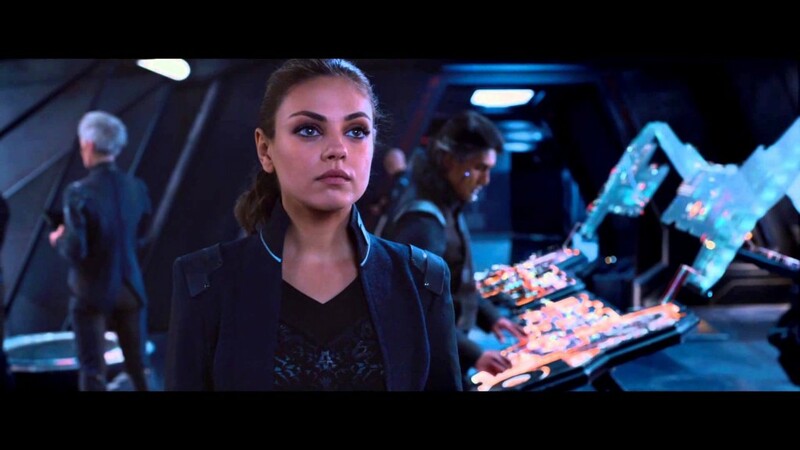 Mila Kunis, although she had the lead role, seemed more like a momentary love interest diversion. Jupiter Jones is a little girl full of naivety and boy crazy urges. Kunis’ Jupiter is Jackie Burkhart (That 70s Show) meets Rachel Jansen (Forgetting Sarah Marshall) meets Jamie (Friends with Benefits). I would have rather seen Kunis’ devious chick with fire, Lily (Black Swan), in this role. She would have been a stronger and less boring presence for sure. I was disappointed by the performance of Eddie Redmayne. After an amazing interpretation of Stephen Hawking in The Theory of Everything, Redmayne comes off as weak in Jupiter Ascending in the role of Lord Balem Abrasax. Redmayne’s portrayal is an anorexic Godfather wannabe and not even slightly menacing villain. Although some of his lines were either mumbled or covered with the volume of the score, Sean Bean (Stinger Apini) is always a good addition to any cast. A wonderful surprise was to see one of my Bollywood favorites, Ramon Tikaram, as the peripheral character Phylo Percadium. I hope to see him in more Hollywood movies. I don’t know much about Douglas Booth, but he is indeed a cutie and played his small role as Lord Titus Abrasax well. Overall, Jupiter Ascending was a disappointment. The graphics and special effects were cool (one in particular reminded me of the 80s film Gleaming the Cube’s opening credits). Tatum’s acrobatics helped keep the film somewhat interesting. However, I think they dropped the ball with the story and plot. The story had great potential, but the film needed slowing down and further elaboration. For example, why the random yellow colored eye transitions? They weren’t associated with emotion or senses as far as could be distinguished. If you don’t mind holes in the story and are willing to settle for explosions, cool tricks, and to look at fine Channing Tatum, go watch this film. The 3D aspect shows depth but doesn’t have much impact. I do not feel it is worth the extra money to see it in 3D, but to each its own. Channing Tatum and Mila Kunis Asked To Star In The Wachowski’s Next Sci-Fi Epic!!! This entry was posted on Friday, February 6th, 2015 at 12:09 am	and is filed under Film, News. You can follow any responses to this entry through the RSS 2.0 feed. You can skip to the end and leave a response. Pinging is currently not allowed. « Podcast #53 – Sundance 2015, February Films, and ‘Caligula’! !